Anthony Scaramucci speaks to members of the media in the Brady Press Briefing room of the White House in Washington, July 21, 2017. “Celebrity Big Brother” has once again dipped into President Donald Trump’s former employee rolls for on-air talent: CBS announced Sunday that Anthony Scaramucci, the man who lasted less than two weeks as the White House communications director, is joining the B-list cast of the “Real World” meets “Survivor” competition series. 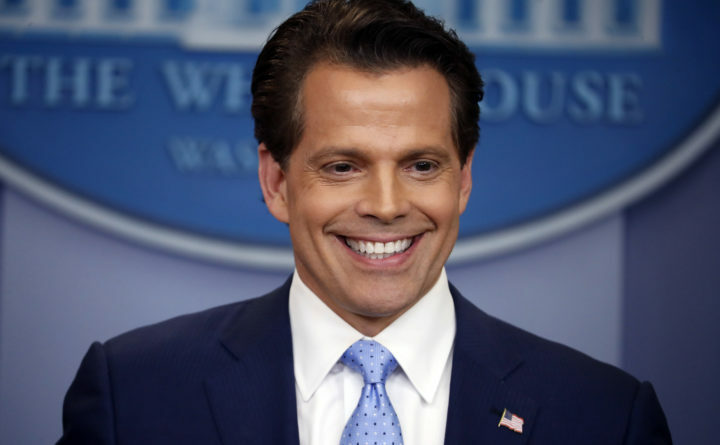 Scaramucci follows in the stilettoed footsteps of former Trump staffer Omarosa Manigault Newman, whose salacious tenure on “Big Brother” was marked by headline-grabbing confessionals about the utter chaos behind the scenes at 1600 Pennsylvania Avenue. While there’s no doubt that “the Mooch” will be dropping gems of his own, as a Trump loyalist, we doubt Scaramucci’s revelations will be half as jaw-dropping as Omarosa’s tea. Joining the Mooch in the “Big Brother” house will be momager Dina Lohan; comedian Tom Green; former WWE wrestler Natalie Eva Marie; actor Joey Lawrence; actor Jonathan Bennett; Olympian Lolo Jones; Olympian Ryan Lochte; former NFL player Ricky Williams; reality star Kandi Burruss; singer Tamar Braxton; and the country’s most infamous house guest, Kato Kaelin.